There is no other motorcycling skill that is as important to develop than is your ability to stop quickly and under control. Let's review a few things to set this discussion up. When you did your quick stop test during your beginning rider course with the MSF, you had to be able to achieve a deceleration rate of 0.6g's in order to avoid getting points against a passing score. That was a trivial effort, though it didn't seem like it when you took the test. But I will remind you that is the benchmark used for brand new riders, on an unfamiliar motorcycle, with all of two partial days of riding experience. A 0.6g deceleration rate is simply inadequate, in my opinion, for qualifying you to ride on our public streets. With almost no experience, and just a little practice, almost any rider can consistently achieve a deceleration rate of 0.7g's. That is sufficient, though barely, to be allowed to ride on our streets. A competent rider, from a braking skill point of view, can consistently achieve a 0.8g deceleration rate. 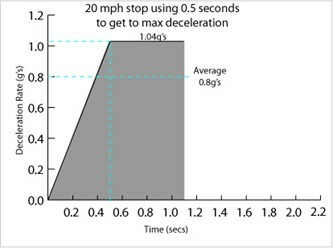 Cars and motorcycles this ABS (turned on) typically achieve a deceleration rate of between 0.85 and 0.9g's during an emergency stop. Car and motorcycle tires skid on typical good quality roads with a deceleration rate of between 0.85 and 0.9g's. That does NOT mean that they will start to skid at those deceleration rates, it means that once they begin to skid, the deceleration rate will fall to and maintain that rate. You will remember that there are two kinds of Coefficient of Friction measurements; the rolling (static) CofF, and the sliding (dynamic) CofF. You will also remember that the rolling CofF is about 25% higher than the sliding CofF. In other words, if a tire has a sliding CofF with a particular roadway of 0.8, then it will have a rolling CofF of about 1.0. Sportbikes will usually perform a stoppie shortly before they reach a deceleration rate of 1.0g's. Other kinds of motorcycles are virtually incapable of doing a stoppie and can reach a deceleration rate of as high as 1.2g's before they begin to skid, if the roadway surface is exceptionally good. So what is threshold braking? It is merely attaining a deceleration rate in excess of the sliding CofF, but not as high as the rolling CofF. Stopping, in other words, faster than you would if you were skidding your tires. I just said that a competent rider can consistently achieve a deceleration rate of 0.8g's. What does that really mean and why not aim for higher? Well, it means that a competent rider can achieve a deceleration rate of 0.8g's if his starting speed in 70 MPH, or if it is 20 MPH. And why not higher? You will soon know. You might think that getting a stopping rate of 0.8g's when starting at 20 MPH is much easier than when starting at 70 MPH. You would be wrong. And as you learn more you will understand why it is so terribly important to practice your stopping skill at relatively low speeds. All you need to know when you are practicing is the speed when you begin braking and how many feet it takes you to come to a complete stop. But all you will be measuring is your AVERAGE deceleration rate. For example, in the old MRC:RSS (pre-BRC) quick-stop test, if you started braking at 20 MPH and came to a complete stop in just over 23 feet, you had an AVERAGE deceleration rate of 0.6g's. Stopping within 20 feet was an average of 0.7g's. Within 17 feet was 0.8g's. And if you came to a complete stop within 15 feet, it was 0.9g's. But average deceleration rates are simplistic. You know that if you start with a deceleration rate of 0.0g's and end up with an AVERAGE of 0.8g's, for some amount of time you must have been slowing down at more than 0.8g's. The deceleration rate you actually managed to attain during that quick stop in also a function of how quickly you managed to squeeze your front brake lever. You know that you cannot simply grab a handful of brake lever, because that will lock your front brake and probably result in your ending up eating asphalt. It takes time for weight transfer to compress your front shocks and result in more traction on the front tire. So, to a very significant extent, the actual rate of deceleration you attain is determined by how quickly you can squeeze the brake lever without locking the brake. Note that in the following discussion we will talk about using ONLY the front brake lever. Assuming you start braking at 20 MPH, if it takes you 0.7 seconds to reach your maximum squeeze pressure with the brake lever, and you come to a complete stop within about 17 feet, while your average deceleration rate will be 0.8g's, you will actually have achieved a rate of 1.17g's while stopping. If it takes you only 0.5 seconds to reach maximum squeeze pressure, you will actually achieve a rate of 1.04g's. And if you can reach maximum squeeze in as little as 0.3 seconds, the actual rate achieved will be 0.9g's. 0.3 seconds to reach maximum pressure is DANGEROUS! It takes longer than that to compress most shocks by about 50% of their travel, so you are looking at high probability of locking the brake if you squeeze that fast. Let's look at 0.5 seconds of squeeze time to see what "very good" performance is and how it actually feels. The total time to stop is always 1.1 seconds if you average 0.8g's, so taking 0.5 seconds to reach maximum squeeze pressure is a very significant fraction of that total. During that squeeze time, as a rider you will feel your deceleration rate climb from zero to 1.04g's and it will average just over 0.5g's (because it is essentially linear). Then you will feel another 0.5 seconds of deceleration at 1.04g's. But the fast and dirty analysis will show that you averaged 0.8g's. Clearly you threshold-braked for at least 0.5 seconds, even though the average was 0.8g's. By simply squeezing a little faster (0.3 seconds instead of 0.5 seconds), you could have used less maximum braking pressure (only enough to get to 0.9g's) and still averaged 0.8g's for the stop. If you are practicing in order to consistently achieve a deceleration rate of 0.8g's, you should do it with a starting speed of 30 MPH instead of 20 MPH, because then you can take a little more time reaching maximum squeeze pressure, and use less maximum braking pressure, to arrive at an average of 0.8g's but you will be feeling the actual rate of 0.9g's. That is, it is EASIER to quick-stop starting at 30 MPH than it is from 20 MPH, and the time to ramp up your squeeze pressure is a much smaller fraction of total time to stop, thus it is less significant. From a safety point of view, it is SAFER to practice quick stops at 20 MPH than at 30 mpg, because by the time a front brake should lock, your bike will almost be stopped. But it is easier to reach an average deceleration rate target by doing it at 30 MPH than at 20 MPH because squeeze time is a smaller fraction of total time to stop. NEVER PRACTICE QUICK STOPS STARTING AT A SPEED IN EXCESS OF 30 MPH!! Your practice objective should be to AVERAGE 0.8g's, not more, because you will have to attain a near skid (threshold-braking limit) in order to reach that average. And, if you can stop with an average of 0.8g's from 20 or 30 MPH, you will automatically achieve threshold braking if you start at highway speeds WITHOUT ANY ADDITIONAL EFFORT - it's FREE. Now let's make this all a bit safer. Rather than using just the front brake lever you should virtually always use both brakes to stop. Any braking force from the rear tire increases total braking force, so in order to get an average deceleration rate of, say, 0.8g's, you will need LESS braking force from the front brake than if you use only the front brake. Further, if you also use the rear brake, your motorcycle will strongly avoid yawing during the stop. And finally, using the rear brake in addition to the front brake means that you can squeeze the front brake just a little bit faster than you safely could when using only the front brake lever. Motorcycle Safety and Dynamics - Vol 2 addresses this topic in detail.